I have this fascination with Circus Side Shows, so I decided to go as a Three-legged Side Show performer. 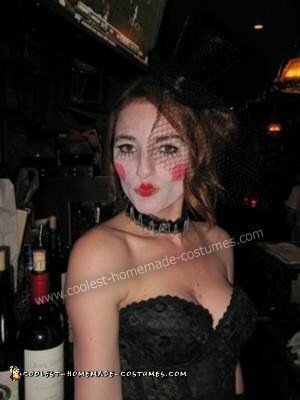 I made the skirt from cute polka dot material, wore a vintage bustier, some mis-matched tights, painted my face white with pink cheeks, and topped it all off with a glittery little top hat. I made the third leg by stuffing a stocking and attaching it to my waist. Since I was bartending that night, the extra limb didn’t stay on for too long – every time I turned it swung out and hit something! It was fun though, I got a lot of compliments for my Three-Legged Circus Freak Costume.